Our range of biometric fingerprint door locks are becoming a favourite for increasingly more industries, including offices, banks, laboratories and hotels. In addition to this, the fingerprint lock can be installed to doors within the home, offices and stockroom. The way in which the biometric fingerprint door lock works is simple; all you have to do is to place your finger on the scanner, it will instantly scan, match and verify your fingerprint. Once your fingerprint has been authorised, you’ll then be able to open the door. Not only are our fingerprint door lock a secure alternative to a traditional keyed lock, but it can also eliminate the need to carry bunches of keys and ensures only people registered in the lock can gain entry. At UK Time Solutions, we supply the fingerprint biometric door locks to provide greater security and simplicity, it makes it much more convenient for staff, meaning that they don’t have to carry keys and it also makes securing a room simple. Find a suitable fingerprint lock today from UK Time Solutions! 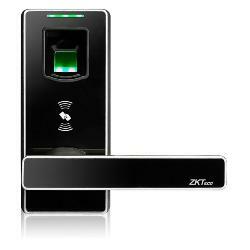 The new ZK L7000 reversible fingerprint and PIN code door lock. One of the most advanced fingerprint locks available at an affordable price. 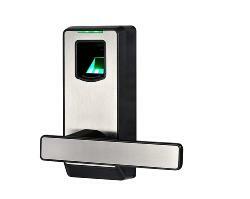 Go keyless with (new) ML10ID Fingerprint / Bluetooth and Proximity Fob door lock. 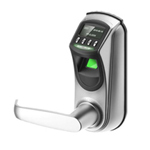 The new stylish PL10LOCK fingerprint biometric & bluetooth door lock. Good looks and great value, activate the lock with either fingerprint or smartphone bluetooth. Simple to install and setup.